An article in the 19 May issue of Business Week, "A Secret Identity for Marvel", uses the success of the movie Iron Man to consider the financial side of this huge cinematic event. First, the awesome box-office numbers. In the opening weekend alone, the movie grossed over $100 million dollars, not bad for our hero's relentless efforts against the evils of terrorists and arms dealers. No doubt such sums bring a tear of joy to the heart of Marvel Entertainment and its Marvel Studio unit. 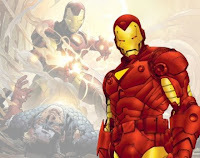 What is even more interesting is the way in which this comic book publisher--known for such icons as Spider-Man and the Hulk-- has succeeded in competing with much larger movie studios in bringing the movie Iron Man to a theater near you. Successful as its character licensing, toy sales and comic books are (they generated $486 million dollars in 2007), Marvel needed to find a way to finance its movie activities. It did so by borrowing $525 million dollars in 2005 in order to create a fund that was intended to invest in movie projects. And how did they go about obtaining the funding? According to the article, Marvel pledged the future film revenues for 12 of its proprietary characters as security for the bank loans., while keeping the business of the film fund off the Marvel balance sheet. In this way, Marvel continued to control their characters commercially . In the past, Marvel simply licensed its characters, such as Spider-Man, for receipt of a flat percentage of the box-office revenue plus amounts received from character merchandising. In so doing, as Business Week noted, Marvel "left a lot of money on the table." No more: In exchange for taking on the direct risk that the movie production might be a failure, the upside is the Marvel will now rake in most of the profits for itself. In the case of Iron Man, these proceeds seem to be substantial. The report indicates that Marvel drew down $150 million dollars from the investment fund to make the Iron Man movie, and it is paying Paramount Studios 10% of net revenues for ticket and video sales, in addition to fees for marketing and distribution. But these expenses will be worth it, when you are talking about a projected $1 billion dollars in revenues, and estimated profits of up to $200,000 million dollars. Of course, we all know that the movie business is a fickle, cut-throat industry, and yesterday's mega-hit may be followed by tomorrow's "flop to end all flops." But Marvel may possess both the necessary creative and financial acumen to successfully merchandise its characters on the celluloid screen, in the digital world, and through the sale of collateral products.